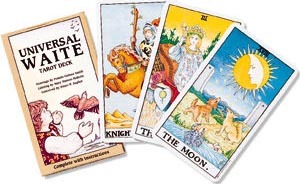 The Universal Waite Tarot is a traditional Rider set of cards that is a near duplicate of the famous Rider-Waite version of Tarot. This deck uses softer color tones and tints instead of the flat, bland, and plainer colorings of the Rider-Waite. Mary Hanson-Roberts, artist of the Hanson-Roberts Tarot, recolorized the traditional version of Tarot at the request of U.S. Games Systems. Her lovely color enhancements reveal great detail for the figures and symbols in the cards. The coloring for this deck is softer and has a more soothing energy which makes the cards appear brighter and generally more attractive overall. I definitely recommend this deck to beginners since it was born from the original Rider-Waite deck. The Rider Waite version of cards remains the most influential deck even among hundreds of selections to choose from for a Tarot deck. 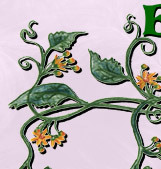 The original artwork in the Rider-Waite was done by Pamela Coleman Smith. Mary Hanson-Robert's rendition brings out the details of the original work in a very pleasing way. The clearer features of this Universal Waite deck are certainly lovely improvements which can be especially useful to the beginning reader. The new delicate shading compared to the starker coloring of the original version encourages focus and can improve readings at any level of experience. Those who have shied away from the Rider Waite Tarot -- due to artwork that lacks appeal -- might like to take a new look through the Universal Waite cards! The re-coloring of the deck breathes new life into the most well-known traditional Tarot deck.